The completely renovated 4-star Moevenpick Hotel Zurich-Regensdorf offers all services and facilities of a first class business hotel. Our 149 renovated hotel rooms with direct access to the 3000 sqm Spa and Fitness Park (accessible from 16 years, chargeable) ensure a comfortable stay for business and leisure travellers.In our Moevenpick Hotel Restaurant we serve the famous Moevenpick breakfast buffet, local specialities and international cuisine. The Italian Trattoria Ciao with its Mediterranean Atrium Garden offers fine Italian cuisine and the Boulevard Lounge is a modern and popular meeting place. Our family-friendly 4-star hotel is centrally located. In 15 minutes you can reach the city centre of Zurich -Switzerland’s largest city- and in only 10 minutes our complimentary airport shuttle takes you to Zurich airport. Plan your next event, your next meeting or private event in one of our 19 meeting and event rooms or in our convention hall, which is the largest hotel convention hall in and around Zurich. In our seminar hotel in Regensdorf we provide you with the latest technology, superior service and excellent food. All this combined makes the Moevenpick Hotel Zurich-Regensdorf the ideal venue for your next meeting, conference or seminar from 2 to 800 people. 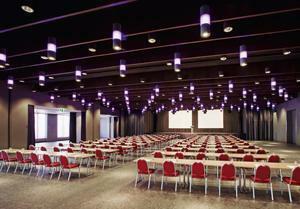 The Convention Center with the largest hall and grand function room in Zürich shows up with a modern design. The stylish setting, parquet flooring and modern lighting conceptin combination with our long-standing experience in the events business create the perfectambiance for your event in a spacious hall measuring 1,155 sqm. For any occasion – whetherfor business or private functions, congresses, seminars, trade shows or elegant galadinners – we are the perfect partner to contact for your major event.